Where I am at in the country, it is starting to already get cold out. Snow might even be hitting us very soon. There is nothing quite like a nice homemade hat to keep the chill out and stay nice and cozy. Crocheted hats are great because they are usually pretty easy to make and can be made in so many styles to keep up with the trends of each new winter season. 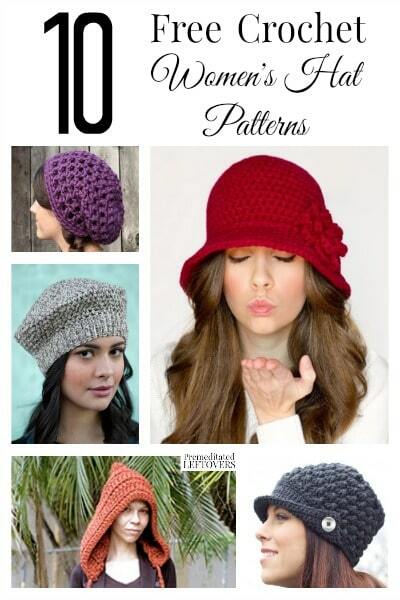 To inspire you to make some hats for yourself or those you love, here are 10 free crochet hat patterns for women. If vintage is your thing, you will love this 1920's Cloche Hat from Hopeful Honey. I think it would look great in a gray or brown to go with anything. This Waffle Cone Slouchy Hat from Gleeful Things is perfect for a casual style dress day. You could even tuck your hair up into it if you wanted. Are you looking for a hat pattern that is more neat? This cute style with a button is perfect for a nice, more polished look. Get the Women's Peak Cap on Yarn Inspirations. This Housewife Life has a great basic pattern for a classic beanie with (or without) the pom-pom. Get the Trinity Stitch Beanie pattern to check it out. This Cross-Over Long DC Hat from Crochet n Craft is great with it's bill and simple design. If you like the slouchy look, but don't want it too slouchy, try making this Ups and Downs Slouchy Beanie from Moogly. This Twizzler Pattern beanie so so unique. It looks like it might be great for a playful look or a teen, even. Get it on Ravelry. I love this Tivoli Beret from Micheal's. This hat would be great for a formal winter meeting or another professional get-together when you want a super elegant look. For a delicate design, make this Crochet Squares hat from Red Heart Yarns. This Chunky Hoodie pattern from Dainty Loops is a great last-minute gift to make as it doesn't seem to take too long to put together. Which hat do you want to make from this list? Let me know in the comments! I fell in love with the largest picture (burgandy hat), but could not find your fee pattern, can you tell how to get it? It is the 1920’s Cloche Hat.